Your pie looks very much like what Mom use to make. There were times when we would make 27 pies at a time. There were always eaten before they could go bad.Love you! You know, Cynthia, the # 27 kept coming to mind but I didn’t want to sound too outrageous! I remember whole pies disappearing in just minutes. Thanks for sharing your memories and for helping to make all those pies so long ago! Your pie looks scrumptious! Do you want some more elderberries? I have a lot I don’t use. I would LOVE some more elderberries, Jane. I’m leaving on Sunday for two weeks in Chincoteague. When are you back? Elderberries are getting scarce here in suburbia as well. Jordan just reminded me how we could pick them from bushes growing by the side of our road ten years ago. And I just heard from a friend who has a friend who owns a farm and her tenant gathered up the elderberries and took them to a farmer’s market! But unfortunately not the markets I go to. Like Celia, I never see elderberries, I’m not even sure I’ve tasted one before. Saying that, if it’s fruit and it’s in a pie Heidi, yep I’d love it no doubt. My mum used to make apple pies all the time. Every time I would go to the fridge to get something I would a break just a little of the pastry off of the remaining pie…I’m sure all my siblings did the same- wasn’t much left it after that! Apple pies are my favorite! We had an old tree that I would gather apples from and cut out all the bad parts and make large sheet pies that could be cut into squares and eaten out of hand. We eat them mainly with a fork- although I’m not averse to ice cream! What do you do with the elderberries you pick? My mother preferred pie to cake or cookies- although she made plenty of those as well. We had a large family and lots of visitors so we had loads of goodies on the weekends! I read a recipe for a condiment called Pontack sauce which you are supposed to let mature for seven years so I had a go at making that. I have used it in casseroles and it gives a wonderful dark colour to the sauce. I think I might have used some in a jam one time but I don’t tend to pick fruits that I am not sure what I will use them for if that makes sense, so they are probably one I leave for the birds. Though I do fancy trying your pie! The more people pick the flowers of course for the cordial, the fewer berries in the autumn.. elderflower cordial is very very popular in the UK. Oh, that is sad. 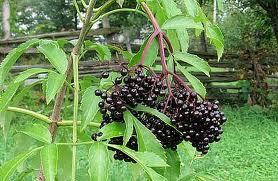 Elderberries grow all over the world- they wouldn’t boycott Canada, would they?